One of the main issues for us is tracking overdue tickets and how they can be better resolved. Missed SLA's are also better tracked to show our team how to avoid this by giving better support or passing along to another level if needed. The reporting mechanism allows us to change on the fly to see where we are lacking support and where we may have too many resources staffed. By utilizing these reports we can move resources around to have better coverage. Email notifications are pretty good; you can add hidden notes, close/resolve/update tickets just by selecting the appropriate link in the email that is sent when a ticket is created or edited. It provides a great deal of information to both the user and tech. It allows us to automatically update asset information with our mobile device management system by using an extension. The Web Help Desk mobile application for iOS is severely lacking. Sometimes email notifications can be very cluttered. It's built on WebObjects which has been deprecated by Apple for many years. We are definitely going to be sticking with Web Help Desk for the foreseeable future since the product is very inexpensive for the features that it provides, the integration that it has with our existing systems, and the ease for managing users, assets, locations, and tickets. 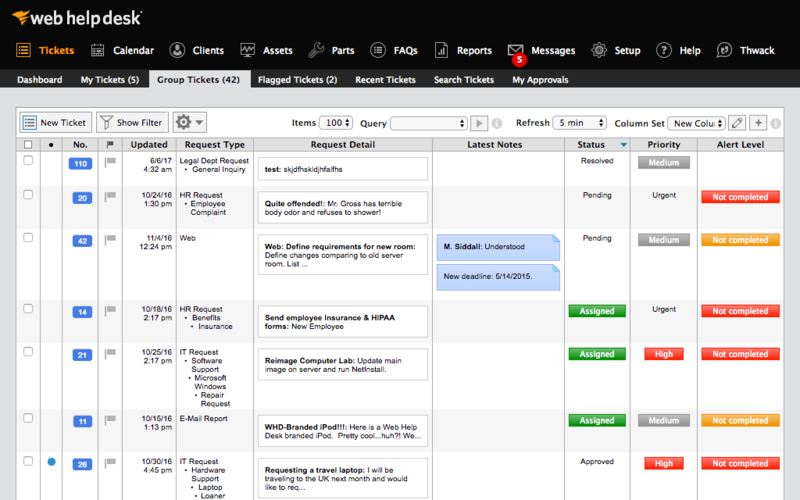 Web Help Desk is a great product that is backed by even better support, which is well worth looking into if you are considering moving to a new ticketing system. The system has time and time again proven to be much easier to use and setup for both technicians and end users. It is simple enough to enter a ticket for end users, and even easier to communicate with logging back and forth because you can reply to the ticket emails to enter comments on the tickets. The technician side is a little clunky at first, but after looking at it for a few minutes it's very clear to see what you need to do to accomplish the goals. The mobile interface is snappy and responsive. It's a great product overall. We've only had a few issues with Web Help Desk, and every time we have contacted SolarWinds they have given us excellent service. We had a problem where Database backups clogged the hard drive and prevented the server from starting back up (which was a critical issue). SolarWinds contacted me in less than 15 minutes after putting in a ticket and the representative was friendly, knowledgeable, and willing to explain best practices to help prevent this from happening again.They get a 7 because once during initial setup we were encountering problems with SSL certificates in Tomcat and the answer they provided us was a little less than satisfactory. We have our SSL certificates issued primarily as Windows PFX/PKC12, and Tomcat only accepts JKS. We were trying to get help on the conversion and SolarWinds kind of left us in a lurch. Thankfully, some people in the support forums had a solution and were able to help us out. Take the time to roll out a test VM to configure and make changes to before doing a live deployment, this way you don't end up with a VM that has been tweaked and re-tweaked until it's perfect and instead end up with a final, polished product.I would also recommend taking the time to read through the support forums for figuring out minor issues that may pop up, chances are that you aren't going to be the first one to encounter them.When all is said and done, SolarWinds Support is VERY responsive and you shouldn't hesitate to contact them. We primarily selected SolarWinds Web Help Desk because of the rich feature set and low price point. When we were doing comparisons of the different suites available, we wanted to find an easy to deploy, feature rich, and inexpensive solution. Web Help Desk met all these criteria. Talking with their sales and support staff prior to the purchase helped us seal the deal. We did a 30 day trial in-house and found that it had every feature we wanted (including the import email system to enter comments on tickets). Additionally we found a large forum with lots of users who have been posting tweaks and configuration guides to get the most performance out of the system. Overall, it was just the best choice for us.